Are you looking for the most useful kitchen knife? Then the ICEL straight and serrated Paring knives are your best choice!! The ICEL Paring knives are available in straight or serrated. The blade length will usually be 3.25 or 4 Inches. The ICEL paring knives are a great choice for dicing, slicing, chopping and mincing, when you want to get the job done fast and clean. These paring knives have an extra good grip, non-slip handle which will make you feel as though the knife is part of you while the knife will do its job for you. The handle of the ICEL paring knives are designed with great Class, there bright classy eye catching colors will surely enhance the mood in your kitchen. The paring knives are a very Classy and stylish Collection which suits for any occasion and surely a great economical gift idea!! ICEL has been chosen by professionals since 1945 for its top Quality, Razor sharp and durable knives. ICEL is counted as one of the top brands in kitchen knives. "We Place Value in Your Hands". ICEL is involved in keeping our environment clean and safe while working to bring you the old Class and Quality together with today's modern technology!! This ICEL knife is made from the best steel available for kitchen knives. It is made of European high carbon stainless steel, a rust and stain free material, that last for ages. Hurry up try and love Yours!! The Icel cutlery 4-inch straight paring knife is great for all smaller kitchen tasks, for example peeling ,dicing , mincing, coring and more. These small versatile knives are a great choice for fruit and vegetable garnishing. The Icel cutlery 4-Inch straight paring knives blade is made of high carbon stainless steel with molybdenum and vanadium. The classic handle is produces from the finest polypropylene. The blades are hand sharpened. 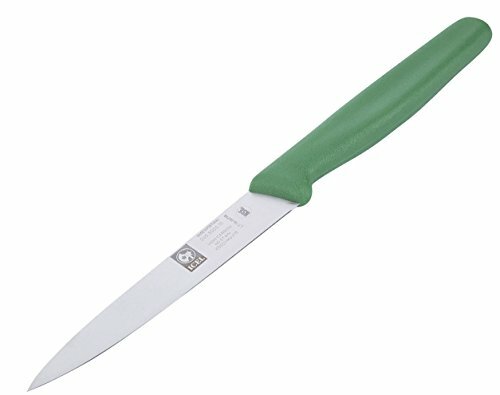 Icel 4-Inch straight paring knife in Red is one (1) of the Icel Classic Color Collection they come in black, white, red, blue, green and yellow. Imported from Portugal, German steel. NSF approved, Microban antibacterial, Icel knives have a life time warranty against faulty workmanship or defects in the material. Dishwasher safe. If you have any questions about this product by Icel, contact us by completing and submitting the form below. If you are looking for a specif part number, please include it with your message.